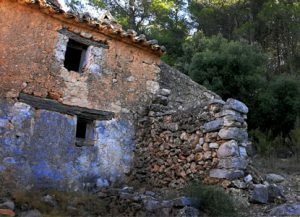 Mas de Burot is situated on a small plateau amid woodlands and it harmoniously integrates in the landscape. It was built on a slope and takes advantage of the gradient and the existing rocks. The farmhouse is on a mountain side, safe from the wind and close to a mountain way and to a natural water source. It is a two-storey building in a rectangular plan to which some extensions have been added. Next to it there is a drystone-walled enclosure for keeping livestock. The façade of the house is in a dominant position facing south. It is a two-storey building in a rectangular plan to which some extensions have been added. Next to it there is a drystone-walled enclosure for keeping livestock. The façade of the house is in a dominant position facing south. - It is located on a gradient in a way that one can enter the first floor directly from outdoors at ground level. - The space was organized to meet functional needs; annexes were progressively added according to them. - Local materials were used for the drystone walls, woven cane partitions, wooden beams, and roof tiles. - The main building presents a two-sided roof where tiles are placed over woven cane structures which are supported by wooden beams that lean on the main walls. - The ground floor was used to keep animals. A special feature of Mas de Burot is the location of the kitchen-dining room area by the main entrance on the ground floor. This is the space of the house more given to social encounters and in this type of building, unlike here, it is usually found on the first floor. Another special feature is that the house lacks of a water tank; they used a nearby source of natural water instead. The house has never been connected to any sort of water or electricity supply. On the first floor there are three small bedrooms, a larder and a storage room. J.V. Lleonart, who lived there in the last years, recalls that the larger bedroom was his grandmother’s, Rosa, in the middle it was his parents’, Francisco and Francisca, and the other one was his and his brother Salvador’s. In the workroom they kept the cart and made woven cane structures, steps and ladders. From here one could access the barn, nowadays without a roof, which in the past featured an overhead woven cane partition that left a small space above it and where the family used to hide household staples in times of rationing. *Information provided by: 'El Mas de Burot. Història social i econòmica' by Salvador Cardó Sabaté (2016) and ‘Conservació i restauració del Mas del Negre, dit també Mas de Burot’ by Consol Marcó Bardella (2016). Mas de Burot was built using traditional methods and natural unadulterated local materials. Today we call that bioconstruction. The exterior walls are covered with lime and clay therefore they provide good thermal insulation: they are breathable and also help to stop the heat coming in during the summer and coming out during the winter. By using highly breathable materials the humidity inside the house is naturally regulated. Another consequence of using natural materials from the surroundings is that the colours of stones and tiles blend with the landscape; this gives Mas de Burot a great value in terms of ecology, aesthetics and sustainability. In order to make the farmers’ life more comfortable the house was built facing south and the local weather factors were taken into consideration when planning the building. Unlike most houses in the area where it is located on the first floor, the kitchen-dining room area at Mas de Burot is located on the ground floor next to a shed for animals and it can be entered through the main door of the house. Animals, usually a donkey and/or a mule, had to pass by the side of the dining room to enter the shed where two large animals could be accommodated. There is a stone oven in the kitchen and the main door boasts an interesting stone arch. The farmhouse has five entrances. All doors, both exterior and interior, are made of pine wood with a simple design. Windows are small, opaque and also made of pine. They are very functional, allowing ventilation and also helping to keep a regular temperature inside the house. In order to benefit from the position of the sun in the sky and enjoy light throughout the day the hinges are placed on the right of the one-sided window shutters. Most room dividers are made of vertical woven cane structures to which plaster has been added. The kitchen has a direct vent oven and the chimney on the roof is covered with four tiles arranged in the shape of a pyramid. The drystone-walled enclosure faces west and was built in modern times to replace a previous enclosure that had become too small for its purpose. Mas de Burot has remained standing throughout different local and national events and conflicts that strongly affected the life of the people who lived there. The first of this series of events is known as the ‘Successos’ d’Orta (‘Events’ of Orta) and took place in 1919. It was a popular uprising against the council authorities, more specifically against the Terrats family who for many years held the power locally by holding administration posts at the council. The uprising took place on July 30th when part of the population managed to disarm the Guardia Civil, attack the town hall, and lynch the mayor, named Onofre Godes, who was going to die two months later as a result of the injuries. Some of the rioters chased his assistant, one of the Terrats family members, who was trying to escape in direction to the village of Prat de Comte. They caught him and attacked him until they thought he was dead but he managed to survive and get help in Prat de Comte. 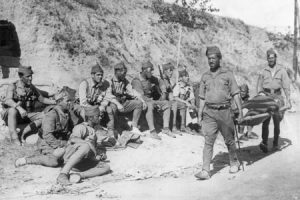 Joan Baptista Lleonart from Mas de Burot took part in the late attack and was lucky enough as to avoid trial however he got so scared that for about five years he remained in Mas de Burot and did not go to the village at all. The eldest brother, Francisco was held in Saragossa as a result of his ill health; seemingly he suffered from a lung condition. He was allowed to come back home for recovery but once at Mas de Burot he was denounced as a deserter and was taken to military court. 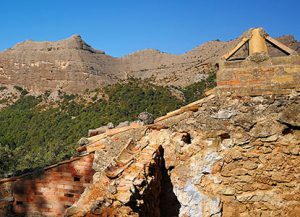 When the Francoist army entered Horta de Sant Joan in April 1938 most villagers escaped in fear and hid in farmhouses and even in caves. At this time Mas de Burot gives shelter to 5 or 6 families. At one point, fearing the Republican army bombings, they will cover the roof with branches of pine trees in order not to be seen by the air force. Once the war comes to an end, a period of rationing applies to both producers and consumers. Farmers will try to hide some of their production either for their private use or to be sold in the black market. In 1945 the owners of Mas de Burot had the type of ration card that was given to underprivileged families such as the ones of farmers, builders and also herdsmen like the family from Mas de Burot. Armed groups known as Maquis opposed resistance against Franco’s dictatorship. There were Maquis at Els Ports where they confronted the Guardia Civil. These rural guerrillas enjoyed the complicity of some of the farmers and this was a key factor for them in order to get supplies. 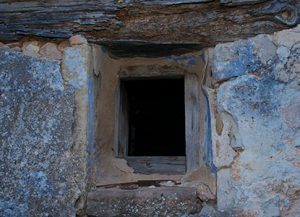 Mas de Burot was not going to have any contact with the Maquis but it will experience the regular patrols carried out by the Guardia Civil around the farms. *Information provided by: 'El Mas de Burot. Història social i econòmica' by Salvador Cardó Sabaté (2016).